Stonehenge is in Whitshire, only 88 miles from London, so if you’re visiting London take a day trip to Stonehenge! Perhaps you’ll see some other amazing sites along the way! If you are unsure how to book your trip — no problem! We’ve got some great tips for you! 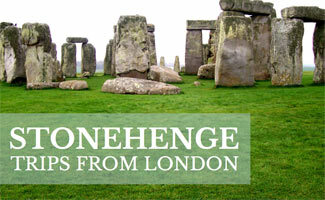 Thinking of visiting Stonehenge from London? You’ve got a couple of options to consider. If you go the public transit route, then you can take a bus or train. If you take the bus, then it’s about 2 hours from either Victoria or Heathrow to Amesbury. Then you have a 2 mile walk or taxi ride. Your other public transit option is to take a train from London Waterloo to Salisbury, which is about 10 miles from Stonehenge. From Salisbury you can take a bus or taxi the rest of the way. Viator is the company we recommend to get to Stonehenge from London reliably if you are seeking the tour route. They offer a variety of tours for you to choose from. Some tours allow you to see other places like Bath and Windsor while others are strictly for Stonehenge. Prices range from $60-$220 depending on the length of the tour, whether it’s private or public and the locations where you will be stopping. Below are four of their most popular trips. Perhaps on your tour you’ll discover some of the secrets of Stonehenge. How was it built? Why was it built? Who built Stonehenge? The questions can go on and on. Have you toured Stonehenge from London? Tell us about your trip and the places you stopped along the way! We love hearing about others’ adventures! What intrigues you most about Stonehenge?